Cup Match is about to ‘jump-off’ and the Bermuda Tourism Authority wants to ensure that the long-weekend of events is fully accessible to as many visitors as possible. The BTA’s Product & Experiences team has launched a tailor-made Cup Match itinerary for visitors that complements and highlights the variety of activities and entertainment options available throughout the holiday weekend. 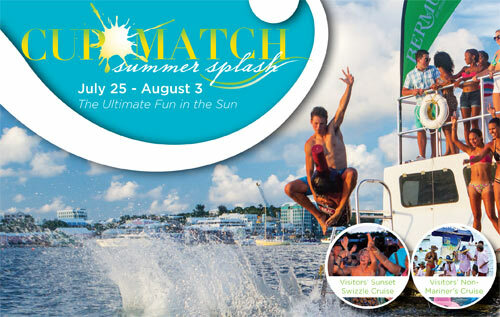 From FREE shuttle service to the Cup Match Classic, between Dockyard and the Somerset Cricket Club, to a Cup Match Visitor’s Guide, two party cruises and Beachfest Visitor’s Tent, the BTA team is ‘connecting the Cup Match experience dots’ for visitors looking to immerse themselves in the festivities. Departs Dockyard (Ferry across from Bonefish) to Somerset Cricket Club: every hour (on the half hour) 9:30 a.m. – 5:30 p.m.
Departs Somerset Cricket Club (Bus stop across from Esso Gas Station) to Dockyard: every hour (on the hour) 11:00 a.m. – 5:00 p.m.
Cup Match 2014 Guide – The Guide contains a listing of activities and events on offer during the Cup Match holiday weekend with a brief description of each. The guide also includes a detailed and illustrated ‘Cricket 101’ for all newbies to the sport and an overview of the historical culture of Cup Match.